We have developed an Obesity and Disability infographic*. The Obesity and disability infographic can be used to educate readers about the prevalence of obesity for individuals with disabilities, the consequences, costs, and ways to prevent or treat obesity. Our lists of consequences and ways to prevent obesity are in no way exhaustive. At the bottom are a few resources readers can access for information on physical activity and nutrition. Also, references where the data came from are listed. *Infographics presents information or data in a format that is easy to read and understand. They are more appealing to read to gain knowledge about a specific topic or subject since they are visually appealing and quick to read. 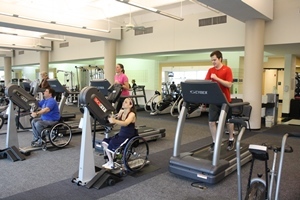 The contents of the Obesity Prevalence, Adaptations and Knowledge Translation in Youth and Young Adults with Disabilities was developed under a grant from the Department of Education, NIDRR grant number H133A120102. However, those contents do not necessarily represent the policy of the Department of Education, and you should not assume endorsement by the Federal Government. Thank you so much for the latest and greatest info. in my battle.